Expelliarmus is the second spell you will learn in Harry Potter: Hogwarts Mystery, in year one chapter four. You had some problems defending yourself against Merula Snyde so you asked Professor Flitwick for help. He said he will agree to teach you a spell but only if you don't use it carelessly. Expelliarmus is also known as Disarming Charm. As the name says, upon casting Disarming Spell you will disarm your target's weapon, or in most cases his wand. It doesn't have to be a weapon, you can make your target release anything from their hands like books, medallions, etc. 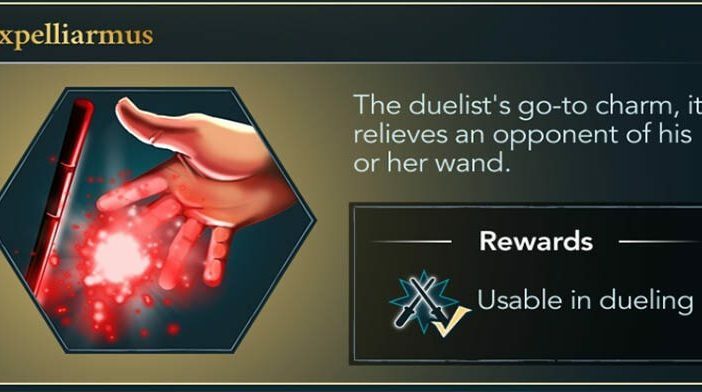 Expelliarmus is one of the most used spells in duels. Sometimes if you put more power into it you will also knock-back your opponent. In order to cast your first offensive spell, you will need to get your stars up by listening toProfessor Flitwick and practicing your charm, stance, your wand swing. When you've done all of your tasks, the professor will tell you that you are ready to try and cast Expelliarmus for the first time. Now to cast your first offensive spell all you need to do is to flick your finger in an upside down L shape as seen in the picture above. If you've correctly done it, your wand will shoot a sparkling red beam towards Professor Flitwick and you will purposely release his wand from his hand. After you've completed everything, you will finally learn an offensive spell and now you can defend yourself from Merula Snyde, and everyone else who opposes you in the upcoming duels. Don't think of this spell as a weak one. The great Harry Potter used the Disarming Spell on many occasions. He even used it in the legendary scene where he was fighting the dark lord Voldemort. Harry put all of his might into channeling Expelliarmus so he even managed to equal the strength of one of the most popular Voldemort curse spells, Avada Kedavra!